I always admire designer Dani Mogstad. I remember when I frequently visits her blog to see her designs and latest layouts with her cute little girl's photos. 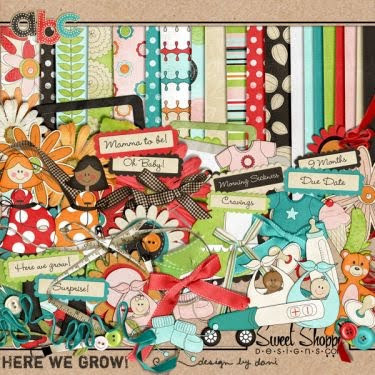 Eventhough I don't buy kits that much lately, this HERE WE GROW kit from Dani Mogstad is so cute and a great buy. Sold at Sweet Shoppe Designs for $7.99 (a bit pricey but worth it). You can scrap baby photos, both girls and boys. Kids grow up so fast even without the aid of hgh supplements these days that's why you need to document their photos as they grow up.